Although I have been posting more lately, I still haven't been posting a lot. Maybe once or twice a week. Last few months have only seen 6 posts each month. So, I was determined to break that mold and get more in for August. At least one more. 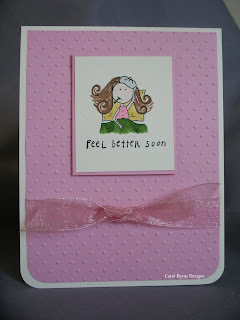 The card below is a sweet Elzybell image with an A Muse sentiment. Cuttlebug swiss dots embossing folder. Made for a friend earlier in the year. Pretty simple and self-explanatory. Awww...how sweet. I know the recipient of this card loved it!